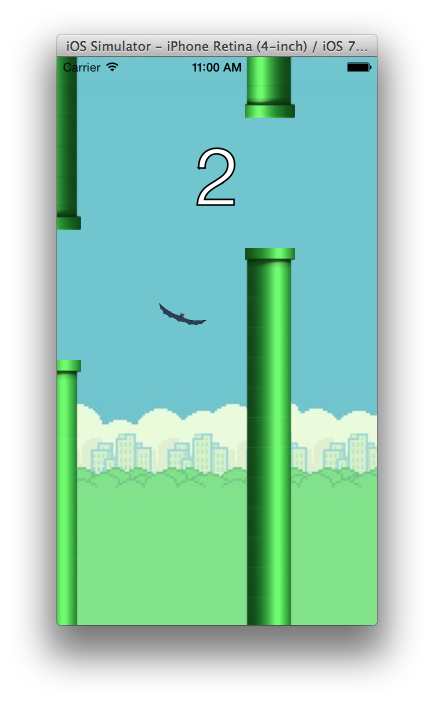 After Flappy Bird was taken down off the App Store, there was an influx of Flappy Bird clones to take its place. 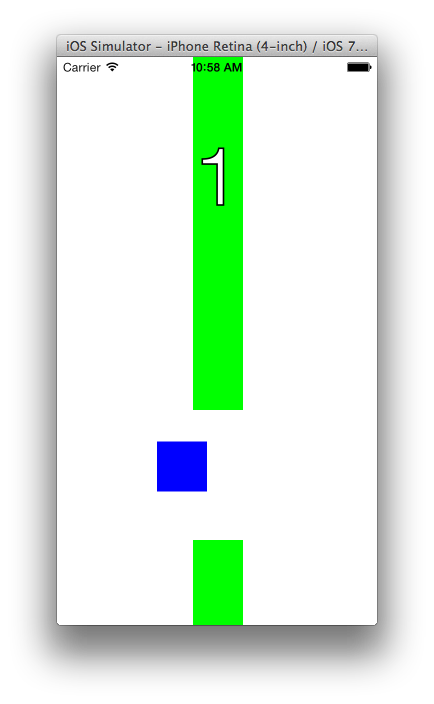 I was challenged by my family to see if I myself could make a clone, and was subsequently shocked at how easy it was to make a Flappy Bird look alike – it only took around an hour and very little code! I had a fun time making my version of Flappy Bird, which I call Flappy Bat, and I thought others might have some fun making their own version. In this post, I will go through step-by-step on how to write a Flappy Bird clone, but if you’d rather just see the code, head on over to https://github.com/jakeheis/FlappyBat. The game is simple enough that no complicated game frameworks need to be used. That means no Cocos2D, no Sprite Kit, no Quartz Core, and, most importantly, no OpenGL. Some prior Objective-C knowledge is definitely needed, however, in order to follow this tutorial. 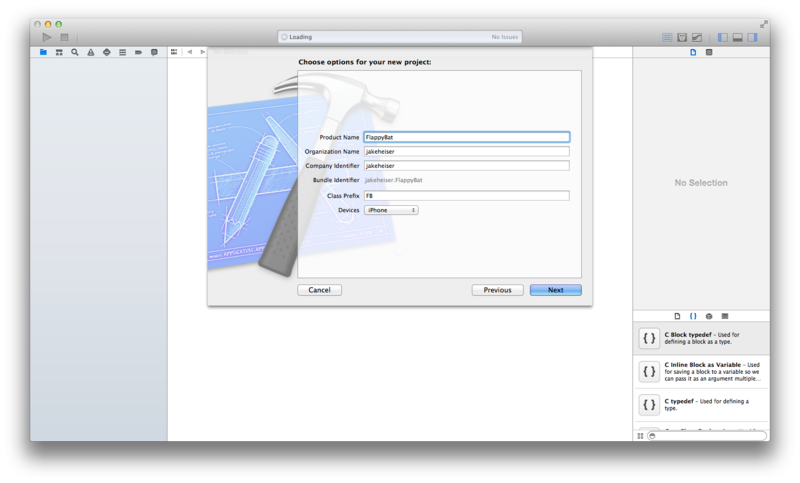 Start by creating a new “Single View Application”. I called mine “Flappy Bat” with a FB class prefix. This code isn’t too complicated. In -viewDidLoad:, we create a nice blue box to be the bat (we’ll come back later to make that an actual animating bat), create the counter label, initialize an empty blocks array, and then call -startTimers. -startTimers creates and starts the display link timer, which will call -tick: at the screen refresh rate (usually either 60 or 30 times a second), and the block timer, which will call -addNewBar: every 1.8 seconds. We then provide empty implementations for those two methods. Also, see those macros, FBBirdStartingFrame and FBPipeDelay? I will be using macros periodically in the code. Don’t be afraid to change these to fit your own liking. You want the game to be harder with the pipes closer together? Decrease FBPipeDelay. Want to make it easier? Bump FBPipeDelay up to 2 seconds or more. Now that we’ve done all the setup, we can start implementing the actual game. First we’ll start filling out the tick: method. moves the bat’s frame down by its current velocity. 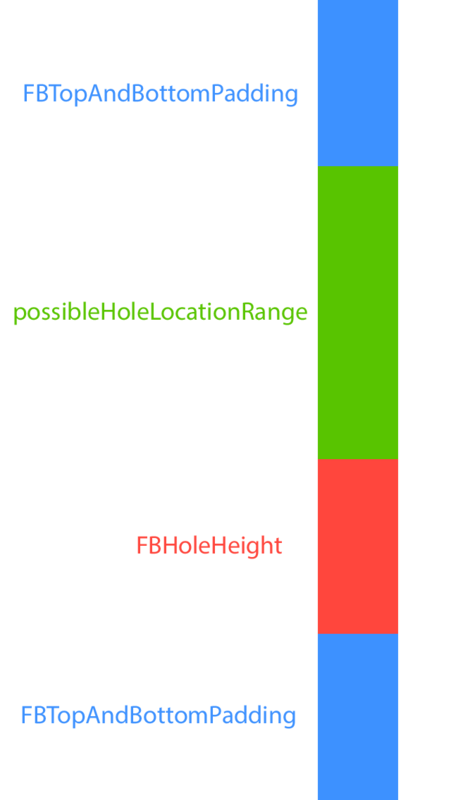 The next line chooses a place in possibleHoleLocationRange for the top of the hole. The rest of that method isn’t as involved. 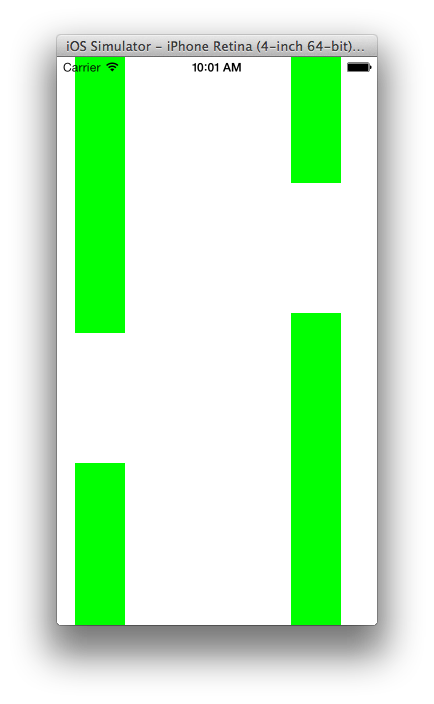 It creates two green bars (which we will later replace with pipe images) horizontally aligned and with FBHoleHeight spacing between them, with the top bar ending at the randomly chosen holeTop. It then adds them to the view and to the blocks array. Here we iterate through the blocks array and shift each block over FBSidewaysVelocity * [link duration]. If the block passes past the end of the screen, we remove it from the view and from the bars array. In -failed, we stop the two timers, then call a -startover method which removes all the blocks from the screen and the block array, resets the position and velocity of the bat, and then starts the timers for a new game. All that’s left to do is add a point counter and the game will be fully functioning! Adding a point counter involves additions in several places. First add a new method -incrementCount. The if-statement we added checks if the left side of a block had passed the left side of the bat, and also checks if the tag of the block is 0. As you can see, if this if-statement passes, we set the tag of the block to be 1 and then call -incrementCount. By only allowing the if-statement to pass if the tag is 0 and then changing the tag to a value other than 0 once it does pass, we insure the condition of the if statement will only be true once for each block. The addition will ensure that the if statement in -tick will only pass for the bottom bar, and so the counter will only go up once every cleared hole. Now that the app is fully functioning, its time to add some images to make it look nicer. All the images I use can be found at https://github.com/jakeheis/FlappyBat/tree/master/FlappyBat, but by all means use your own images and put a little spin on the game if you want! – I added a nice little start screen included in the game, but I’ll leave that to you to figure out how to make! I hope you enjoyed making your own sweet, customized version of Flappy Bird! Obviously it is still missing some features of Flappy Bird like Game Center integration or high scores, but this tutorial hopefully at least helped you build a more bare bones version that works none the less! This entry was posted in Uncategorized on February 13, 2014 by jakeheis.